The research aimed to study the effects of size reduction and composting duration of empty fruit bunches (EFB) on straw mushroom production, and to examine the doses of fertilizers commonly used among farmers. The experiment was done in two stages. The first stage was for identifying the optimum physical parameters of EFB, and the second stage focused on enhancing the performance of EFB chosen based on the findings of the first experiment. A randomized complete block design with 3 × 3 factorial arrangement in both stages of the study used the same approach. The first stage had three levels of aggregate sizes factor (S) and three levels of composting duration factor (C) of EFB. The second stage had three levels of NPK factor (N) and three levels of organic fertilizer factor (O). Whole stalk EFB had the highest productivity of 2458.47 ± 1015.23 g m−2. The supplementation of fertilizers increased the EFB decomposition rate and productivity to 2950.24 ± 208.50 g m−2, and nutritive values (particularly for protein content of 41.00 ± 3.79%). Averaged biological conversion efficiency (BCE) was also improved from 3.61 ± 1.22 to 6.56 ± 0.46%. EFB did not need to be cut into smaller pieces, and should not be composted for more than 8 days, because there was a tendency to decrease yield. Supplemental fertilizers increased the decomposition rates of EFB as well as the yield and nutritive values of straw mushroom. BCE can potentially be improved by increasing the dosages of fertilizers. Indonesia’s palm oil mills process a large amount of oil palm (Elaeis guineensis) and they produced a large amount of empty fruit bunches (EFB) which are currently discarded as waste. For each bunch of fresh fruit bunches (FFB), about 21% palm oil, 6–7% palm kernel, 14–15% fiber, 5–7% shell, and 23% EFB is obtained (Dalimin 1995). In 2015, Indonesia’s oil palm plantation area was around 11.3 million ha, producing about 31.3 million tons of EFB, and generated about 7.2 million tons of EFB (Ministry of Agriculture 2017). Although some of EFB are used as organic mulch in gardens, majority of them are not utilized (wasted). Many private palm oil mills receive EFB directly from the farmers, and the EFB is simply discarded around the premises as waste, polluting the environment. Composting and redistributing EFB into the plantations may be a good way of managing the EFB waste from palm oil mills, but only a few of them practice this management scheme because it is considered not cost effective. A more traditional method of EFB utilization is for the cultivation of straw mushrooms in individual farms. Farmers use EFB collected from palm oil mills as a growth medium (substrate) for cultivating mushrooms directly without any pre-treatment, resulting in lower biological conversion efficiency (BCE). Edible mushrooms are high-value products, they have a delicious taste, soft texture, and the crude protein content is about 25.9–28.5% (Sunandar 2010), and they have been cultivated for long time (Sánchez 2004). Although the cultivation of mushrooms as a nutritious food (Cheung 2013) has been widely practiced (Chang and Wasser 2017), the production rate remains below the consumers’ demand. The demand for mushrooms in Indonesia in 2010 was about 25 tons per day, but its production was only 15 tons per day (Hendritomo 2010). Globally, the world’s production of edible mushrooms (and truffles) has almost doubled in the past decade from 5.9 million tons in 2007 to 10.2 million tons in 2017 (Faostat 2019). Developing methods of using EFB as a growth medium for straw mushroom can potentially improve the supply of mushroom in palm oil-producing regions of the world to meet the strong demand. There have been a number of research efforts in the use of EFB for cultivating oyster mushroom (Pleurotus ostreatus) including the following cited literatures: Tabi et al. (2008), Rizki and Tamai (2011), Sudirman et al. (2011), Kavitha et al. (2013) and Marlina et al. (2015). Some works on EFB as a biofertilizer have been published including: Kananam et al. (2011), Hayawin et al. (2012), Hoe et al. (2016), and EFB works in bioenergy (Sudiyani et al. 2013; Chang 2014; Tye et al. 2014; Muryanto et al. 2015; Zulkiplea et al. 2016). Agricultural wastes from cotton (Sukendro et al. 2001; Rajapakse 2011), coffee husk (Mayun 2007), oil palm fiber (Onuoha et al. 2009; Ichsan et al. 2011), coconut husk (Rahmanda 2014), banana leaves (Belewu and Belewu 2005) or their mixtures have been investigated as growth media of straw mushroom. Straw mushroom can be cultivated with a variety of agricultural solid wastes other than rice straw. Straw mushroom cultivation using EFB substrate has been reported by Thiribhuvanamala et al. (2012). In their research, straw mushroom was cultivated on various agricultural solid wastes including oil palm bunch waste, but there was no mention of any preparation or pre-treatment process of the oil palm bunch. Published research showed that proper pre-treatment of mushroom growth media is required to improve productivity. The pre-treatments include: composting, addition of supplemental nutrients and pasteurization. It was reported that composting of substrate for a period of time (Vargas and Hepperly 1986) prior to pasteurization softened the EFB and helped in the breaking down lignin (de-lignifications) (Wood and Leatham 1983). There is no standard operating procedure in determining the duration for composting EFB media and whether composting is mandatory. Consequently, some farmers do compost EFB growth media, while others do not. The duration of composting cotton waste has been shown to have a significant impact on the productivity of straw mushroom (Sukendro et al. 2001). Arifestiananda et al. 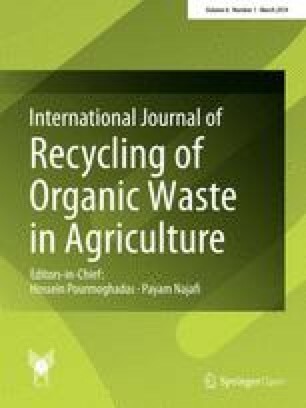 (2015) found that a 5-day duration for composting rice straw was the most optimum composting time, based on total weight and the number of fruit bodies harvested. Physical properties of the media including their crystallinity, surface area, porosity, and particle size were also known to affect mushroom growth (Pandey 2003; Viniegra-González et al. 2003). For oyster mushroom, EFB were mostly chopped into smaller sizes to prepare it as a substrate (Sudirman et al. 2011; Kavitha et al. 2013). Reducing the physical size of EFB prior to its use as the substrate for straw mushroom may have positive effects on production, because it results in larger total particle surface areas. The spent EFB may also be more practical for further usage as a biofertilizer, as an aggregate to mix with other compost materials (Nugroho et al. 2012; Dermiyati et al. 2015), for dietary supplement of animal feed (Fazaeli et al. 2014; Fard et al. 2014), or for use as a biogas feed stock (Williams et al. 2001). EFB contains 23.7–65.0% cellulose, 20.58–33.52% hemicellulose and 14.1–30.45% lignin (Sreekala et al. 1997; Abdullah et al. 2011; Omar et al. 2011; Apetorgbor et al. 2015). The high cellulose content makes EFB the potential to be used as a substrate for cultivating straw mushroom (Zakhary et al. 1984), and reducing its size may also improve the BCE. Other nutrients such as chicken manure, rice bran, lime, and organic or inorganic fertilizers are often added into the growth media during preparation for mushroom cultivation (Zakhary et al. 1984). These supplements were intended to enrich the nutrient contents of the mushroom substrate (Fasidi and Akwakwa 1996; Banik and Nandi 2004). The purpose of this research is to explore the effects of size reduction, composting duration of EFB growth medium on the mushroom production, and to investigate the doses of fertilizer supplements commonly used among farmers. This research was conducted in the months of April–October 2017 at the Experimental Station of the Faculty of Agriculture, Lampung University, Indonesia, inside a 4 m wide, 6 m long, and 5 m high mushroom house. The structure was constructed on a concrete slab foundation with 1 m high brick walls on the lower part as shown in Fig. 1a. The upper part of the structure was made of steel frames, and the perimeter was covered with netting, semi-transparent tarpaulin, and 14% UV transparent plastic to prevent excessive direct sunray from penetrating into the room. This setting was similar to what is normally done by local farmers. A woven asbestos roof top was used and the ceiling was made of 5 mm plywood to reduce the effect of excessive heat penetrating the roof. There were two racks with three layers of wooden shelves in each (Fig. 1b) situated inside the mushroom house with 1.5 m spacing between them for human access. Each layer of the shelf held nine trays of growing beds, and there were a total of 27 trays of equal size. The dimensions of the trays were 75 × 75 cm2 square and 25 cm depth (Riduwan et al. 2013). The total space occupied by the racks was 4 m long × 3 m wide, giving about 1.5 m for front space, 0.5 m for right, left, and back spaces of the mushroom house. The shelves were isolated by a sheet of tarpaulin to prevent leachate contamination between an upper bed and the bed below it. The mushroom house was equipped with two units of 35 cm diameter fans for air intake and exhaust (each 350 W), one unit of circulation fan, four units of water spray nozzles, and one unit of electric heater (700 W) to control temperature and humidity of the room. The room’s air was replaced with fresh air by the intake and exhaust fans, it was done particularly when temperature became high around noon and when relative humidity (RH) became high during midnight to early morning time period. The temperature and humidity of the mushroom house were monitored and controlled automatically by a microcontroller (An Arduino Mega-2560) with data recorded peripherally. Twenty units of DHT-22 (from Aosong) integrated temperature and humidity sensors were used, with 18 units of the sensors located in a regularly spaced manner inside the room, 1 sensor was put in the attic, and the last one was put outside of the mushroom house. The temperature and RH inside the mushroom house were maintained at the optimum condition of average in temperature and humidity of 28–33 °C (Reyes 2000) and 80–95% (Thiribhuvanamala et al. 2012), respectively. The study was carried out in two sequential experiments. The first experiment was to evaluate the effect of size reduction of EFB medium and composting duration on the mushroom production. The second experiment was to leverage the findings of the first experiment and to examine the dosage of additional inorganic and organic fertilizers normally used by local farmers for the mushroom production. The EFB waste was transported from the nearby palm oil mill the same as what was normally collected by local farmers for mushroom cultivation. The EFB taken had been in a pile outside the mill for about 1 month, while supplemental materials such as rice bran, chicken manure, and lime were obtained from available sources; inorganic and organic fertilizers were bought from the nearest farm shop, and commercial F3 straw mushroom seed was purchased from a local producer. The experiment used randomized complete block design (RCBD) with a 3 × 3 factorial arrangement, and in three replicates. The two factors were the size reduction, and composting durations of EFB. The EFB size reduction (S) factor had three levels: EFB stem as the small part (S1), EFB hump as the moderate part (S2), and EFB whole stalk (S3) (Fig. 2). The composting durations (C) factor had three levels: 2 days (C1), 5 days (C2), and 8 days (C3). Each treatment combination was replicated/blocked (R) vertically in three layers of the shelves, so there were 27 experimental units. The data set was analyzed using analysis of variance and followed by LSD multiple comparison tests. The EFB was first processed and cut into nine groups at one time, consisting of three groups of stem (S1), three groups of hump (S2), and three groups of whole stalk or left uncut (S3). Each group of 100 kg EFB was put into a sack, and soaked in water overnight, then removed from the water and drained. Each sack of the moistened EFB was poured out from the sack and thoroughly mixed with supplemental materials: chicken manure, rice bran, and lime. The dosages of supplemental materials were: 80 kg chicken manure, 70 kg rice bran, and 60 kg lime per 1000 kg of EFB for each sack of the mixture. Each resulting mixture was put back into each sack and was composted in the sack for 8 days (C3). From this procedure, we had three treatment combinations of S1C3, S2C3, and S3C3 in three replicates. Three days later, other nine groups of EFB were processed with the same procedure and composted for 5 days (C2). From this procedure, we had other three different treatment combinations of S1C2, S2C2, and S3C2 in three replicates. Again, after 3 days, other nine groups of EFB were also processed with the same procedure and composted for 2 days (C1). From this procedure, we had other three treatment combinations of S1C1, S2C1, and S3C1 in three replicates too. Two days later, all 27 sacks of the composted EFB were collected and transferred to the growing beds in the mushroom house randomly. By doing this procedure, we collected composted EFB at the same time but with different maturity. The second experiment used randomized complete block design (RCBD) with a 3 × 3 factorial arrangement in three replicates. The factor was inorganic fertilizer (14%N, 14%P, 14%K) and the second factor was a commercial liquid organic fertilizer. The inorganic fertilizer factor (N) had three dose levels: 25 g (N1), 50 g (N2), 75 g (N3), and the organic fertilizer factor (O) had three dose levels: 5 cc (O1), 10 cc (O2), and 15 cc (O3). Doses of N2 and O2 were according to what normally used by local farmers. The treatment combination was replicated vertically in three shelf layers (blocks), so there were a total of 27 experimental units, and each shelf of trays used 100 kg EFB mixed with other substrates. The data collected was analyzed using the analysis of variance method followed by LSD multiple comparison tests. The second experiment was conducted after completion of the first experiment (after the mushroom had been harvested and the data sets had been analyzed). The second experiment was set up using the most optimal treatment combination of EFB size and composting duration determined from the first experiment, with the addition of inorganic and organic fertilizers. The EFB bulk materials were initially split into 27 groups each weighted for 100 kg and put it into a sack (a sack became an experimental unit later on) at a time. All sacks of EFB materials were soaked in water overnight then drained. Each sack of EFB was poured out and lime, rice bran, and chicken manure were added with the same doses as in the first experiment. Inorganic fertilizer (14%N, 14%P, 14%K) and organic fertilizer (a commercial liquid organic fertilizer) were diluted in 2 L water and then spayed onto the media according to the designed treatment. Each group of the materials was mixed thoroughly then put back into each sack. The 27 sacks of the prepared substrates were composted for the optimal duration determined from the first experiment. After the composting had completed, all the 27 sacks of the growth media were transferred randomly to the growing beds in the mushroom house according to the rules designed for the experiment. The media were ready to be pasteurized and then inoculated. To pasteurize the mushroom house, water in three 200-l drums were brought to boil outside the mushroom house; all openings (doors and vents) were shut tightly. The steam was piped into the mushroom house until the temperature inside the house reached 60–70 °C, and the temperature was maintained for approximately 5 h. The purpose of the pasteurization was to kill pathogenic organisms and to suppress wild fungal spores (Kurtzman 2010) that could compete with the cultivated mushrooms. After 5 h of steaming, the temperature of the pasteurized media was allowed to naturally cool to ambient temperature (about 28–32 °C). The growth media was then moistened with water spray. Commercial F3 mushroom seed of 500 g was spread evenly on the surface of each bed, then the door and ventilations of the mushroom house were closed tightly for 4 days at ambient environmental condition. Four days after seeding, the automatic control device was activated to control and record the temperature and humidity of the mushroom house. The temperature was maintained around 28–33 °C by means of exhaust fans which were activated when the room temperature was above the set point. An electric heater was used to provide heat when the temperature dropped below the set point. The humidity was maintained at about 80–95% using mist spray nozzles and exhaust fans. The beds of growth media were shielded by the tarpaulin sheet to minimize the effect of water spray. The growth media were hand sprayed every other day to maintain the moisture in the growth media. The first harvest was done at days 8–10 after spawning, when the mushrooms were at the egg/button stage, before the opening of the cap of the fruit body. The fruit body was picked at around 4.00–5.00 a.m. The follow-up harvests were done whenever the fruit body was at egg stage. The number of fruit body harvested was weighed and counted and the diameter and height of fruit body were measured using a caliper. Proximate analyses (crude protein, crude fiber, fat in the fruit body) were determined by the standard methods as described by Helrich (1990); Carbohydrate was calculated by subtracting the total of protein, fiber, and fat from initial weight. Water and ash contents of the fruit body were determined gravimetrically. Cellulose, hemicelluloses, and lignin contents of EFB before and after used as mushroom growth media were measured using the Chesson method as described by Datta (1981). Biological conversion efficiency (BCE) was calculated by taking the ratio of fresh yield to dried weight of the growth medium. The room temperature and relative humidity (RH) of the mushroom house were recorded every 15 min, starting from the 50th day of spawning to the end of harvesting. The settings used were 28–33 °C (Reyes et al. 1998) for temperature and 80–95% for RH. The data showed that the averages of temperature and RH were 28.07 ± 2.25 °C and 93.89 ± 7.06%, respectively. The temperature average was near the lower set point level, while the average RH was near the upper set point value. The controllability of temperature and RH are sufficient and did not pose any observable problem to the growth of the mushrooms (Fig. 3). The appearance of wild fungi was observed, corroborating the findings of Vargas and Hepperly (1986) who stated that competitors or wild fungi were more antagonistic at low temperature (27 °C) than at 35 °C. Some species of wild mushrooms observed in these experiments was not identified because it was not a focus of this study. In the first experiment, interaction effect between EFB size and composting duration on fruit body yield was found to be not significant (p > 0.05). The effect of EFB composting duration on the fruit body yield was not significant either. The size reduction of the EFB, however, significantly affected most parameters (total weight, number, button weight, and diameter) of the fruit body (p < 0.05). Reducing the size of EFB from S3 to S2 and S1 significantly decreased the total weight of fruit body, thus reducing BCE as shown in Table 1. Total number, individual weight, and diameter of button were also negatively affected by reduced sizes of EFB, while height of button was not affected. The effect of substrate composting duration factor (C) on all parameters was not significant. Arifestiananda et al. (2015), using substrate of rice straw, found that composting duration of 5 days was significantly different from composting durations of 10 and 15 days in term of total weight and number of fruit body harvested. In this research, even though statistically not significant, the weight and number of fruit body parameters tended to noticeably decrease with composting duration. The levels of composting durations (C1, C2, and C3) may be too narrow. This fact suggested that single EFB substrate may not be composted for longer than that in this study because it can potentially decrease mushroom yield. Based on the reduced sizes of EFB aggregate, the highest productivity of 2458.47 ± 1015.23 g m−2 was found in S3. This productivity is higher than that usually produced by farmers (about 1700 g m−2, based on personal communication). For initial EFB water content of 55%, however, the highest BCE was 5.46 ± 2.26%, slightly lower than what farmers have (about 6.35%). This is because weights of EFB used per m2 bed are different. Treatment of S3 also produced the highest total number of fruit body (218.86 ± 82.75) and highest weight of individual fruit body (11.20 ± 1.27). Height of individual fruit body in S3 was not different, but in term of diameter, the fruit body from S3 was still bigger than in S1. Therefore, it could be said that treatment of S3 was the best over S1 and S2. The fact that reduced size of EFB aggregate decreased productivity was in contrary to the hypothesis because smaller aggregate of growth substrate had larger total surface area and was supposed to be more conducive to the productivity of the mushroom. This may indicate that other factors in smaller aggregate growth media played a role in productivity, an issue needing investigation in the future. It was observed that S1 had the tendency of being more compact or dense as compared to the other two treatments (S2 and S3). Based on literature, straw mushroom productivity is dependent on growth media, environment, climate, and cultivation systems. Thiribhuvanamala et al. (2012) stated that the variability in mushroom productivity may be attributed to certain physico-chemical factors such as temperature, O2, CO2, aeration, wetness and compactness of the beds. He reported that more compact substrate beds gave better production because compact bed might have experienced homogenous moisture level and bed temperature between the layers, which would have facilitated better proliferation of the mycelium, production of more pinheads and buttons with ultimate increase in yield. Apetorgbor et al. (2015) also found that plantain leaf bundle substrate (supposed to be more compact) was more productive than chopped loose plantain leaf with BCEs of 25% and 15.7% respectively for oil palm mushroom (different strain from straw mushroom in this study). With cotton waste and oil palm fiber substrates, the BCEs were even worse (0.3% and 1.6% respectively). In contrast, BCE (26.7%) of chopped rice straw was higher than BCE (3.7%) of rice straw bundle. Apetorgbor et al. (2015) mentioned that aeration and drainage of substrates, other than temperature and humidity, could be addressed to the variations of productivity. The compactness of the substrate should be accompanied by better porosity among the aggregates, so aeration and drainage were favorable. In this study, S3 aggregate (like a banana leaf bundle) was more compact, but probably had better aeration and better drainage among the stalks, so produced higher BCE. This finding suggested that EFB did not need to be chopped to smaller sizes if utilized as mushroom media. The whole stalk EFB was further tested in the second experiment, using 5 days composting. The second experiment was to determine the optimum doses of inorganic and organic fertilizers added. The results showed that none of the yield parameters was statistically significant (p > 0.05) as shown in Table 2. The normal doses of inorganic and organic fertilizers (N2 and O2) as mentioned above were in fact taken from what was normally practiced by local farmers. The doses of inorganic and organic fertilizers in the second experiment included 50% below normal (N1 and O1) and 50% above normal (N3 and O3), and there was no significant difference in all yield parameters (p > 0.05). When compared to the results in the first experiment, all parameters were relatively higher (with no statistical analysis) except for the diameter of the fruit body. Yields ranged from 2697.61 ± 913.64 to 3177.88 ± 1089.12 g m−2, BCEs ranged from 5.99 ± 2.03 to 7.06 ± 2.42%, the number of fruit bodies ranged from 278.12 ± 83.73 to 340.54 ± 135.01 buttons m−2, and individual weight ranged from 8.76 ± 1.58 to 10.41 ± 1.18 g button−1. The productivity was in general improved upon fertilizer addition when compared to the first experiment. The BCEs of some treatments were also relatively higher than what farmers have. When compared to some literatures, however, the BCEs found in this research were considered low to some extent. This may be attributed to other physico-chemical properties of EFB, one of which is density, but may need to be investigated further. Bulk density of fresh EFB is more likely higher than that of any other substrates such as cotton waste, rice straw, sugarcane bagasse, and banana leaf. The high bulk density was supposed to contribute to lower BCE. The relatively highest productivity of 3177.88 ± 1089.12 g m−2 (BCE of 7.06 ± 2.42%) in this research was comparable to the research finding done by Zakhary et al. (1984), who demonstrated that productivity of straw mushroom ranged from 309 g m−2 (BCE = 1.5%) on a single substrate of paddy straw to 5029 g m−2 (BCE = 14.7%) on mixed substrates of orange juice waste, sugar cane, bagasse, horse manure, and mollases. Another research done by Rajapakse (2011) produced the lowest straw mushroom productivity of 1730 g m−2 on paddy straw substrate to the highest straw mushroom productivity of 5380 g m−2 on cotton waste substrate. The productivity in this research was even better than what Vargas and Hepperly (1986) found (465 g m−2, BCE = 3.16) in straw mushroom using the substrate of sugarcane bagasse. Compared to the finding of Belewu and Belewu (2005) (2500 g m−2 of straw mushroom cultivated on substrates of banana leaf bundle), the productivity was still better. But, BCE found by Belewu and Belewu (2005) was 15.21%, which is much higher than in this study. A more inspiring research finding was found in the published work of Thiribhuvanamala et al. (2012). Using the supplement of micronutrient-based boosters, they found BCE of 20.8 ± 0.95% for straw mushroom cultivated on a single substrate of 4 kg oil palm bunch waste (supposed to be the same property as in this research). In spite of different environment, local climate, and techniques, which affect mushroom productivity (Chang and Wasser 2017), the doses of fertilizers used in this research (and also used by farmers) seemed too low [referring to Reyes (2000) who used dose of 500 g NPK to cultivate straw mushroom on 100 kg paddy straw]. The BCEs found in this research were still considered low and potentially can be enhanced. Enhancement of BCE may be through applications of higher fertilizer doses, micronutrient-based boosters, or using mixtures of substrates from other agricultural wastes. The final choice, however, needs to be practical yet beneficial to local farmers. The physico-chemical composition of mushroom fruit body harvested was analyzed based on crude protein, fat, crude fiber, carbohydrate, water, and ash contents. In the first experiment, there was no significant interaction effect between size reduction of EFB (S) and composting duration of EFB (C) factors (p < 0.05) on the physico-chemical composition of fruit body (Table 3). The factor of S was significant, but the factor of C was not. Protein was the only parameter that was significantly affected by S. The data showed that reducing the sizes of EFB from S3 to S2 and S1 tended to increase the protein contents (from 29.67 to 38.27%). Fat, crude fiber, water, and ash contents were not significantly different among the treatments of S and C. In the first experiment, there was no fertilizer added to the substrate to enhance the nutritional values of mushroom, but rice bran, chicken manure, and lime. Chicken manure was the primary nitrogen source in the substrate. Reduced sizes of EFB may result in more uniform mixtures with other materials, leading to better nitrogen uptake and increasing the protein content of mushroom. In the second experiment, NPK and organic fertilizer were added to enhance both productivity and quality of mushroom. Result showed that none of the physico-chemical compositions of fruit body was significantly affected by the interaction effect between N and O (Table 4). Simple effects of N (NPK fertilizer) and O (Organic fertilizer) were not significant either. As discussed above, fertilizer additions were in fact too low, that even increase of 50% did not significantly increase productivity. However, fertilizer addition in the second experiment remarkably enhanced nutrient contents of mushroom relative to that in the first experiment, particularly for crude protein and crude fiber. This is in line with what Jeznabadi et al. (2016) found, that supplement combinations could enhance both the production and quality of mushrooms. On average, crude protein increased from average of 33.47 ± 3.08% to 41.00 ± 3.79%, and crude fiber increased from 7.74 ± 0.76% to 16.06 ± 1.55%. Fat, water content, and ash did not much change, while carbohydrate automatically decreased because it was calculated based on protein, fat, and fiber contents. Crude protein content reported by Zakhary et al. (1984) was 30.8% which was lower than that found in this research. Fat, crude fiber, carbohydrate, water, and ash content, however, were in agreement with what Zakhary et al. (1984) reported. Belewu and Belewu (2005) found crude protein (10.25%) and crude fiber (9.23%) contents of straw mushroom cultivated on treated banana leaves which is still lower than found in this research. In conclusion, the supplemented fertilizers noticeably improved both productivity and nutritive values of straw mushroom. Before being used as mushroom growth media, EFB’s contents of cellulose, hemicelluloses, and lignin were measured and the results are presented in Table 5. According to Bledzki and Gassan (1999) cellulose is a linear condensation polymer consisting of d-anhydroglucopyranose units. Hemicelluloses comprise a group of polysaccharide (excluding pectin). Lignins are complex hydrocarbon polymer with both aliphatic and aromatic constituents. In the first and the second experiments, initial contents of cellulose, hemicelluloses, and lignin were considered to be the same and averaged. The cellulose content was much lower than that (65%) reported by Sreekala et al. (1997). This may be because the EFB used in this research was at least 1 month old in a pile outside a mill. But the cellulose content was higher than reported by Kavitha et al. (2013). The content of hemicelluloses was also less than 30.5% as reported by Apetorgbor et al. (2015), but (including lignin) still in the range as reported by Omar et al. (2011) and Chang (2014). The variations of the components may depend on plant variety, plantation management, locations, climate, and freshness of the EFB waste. After being used for mushroom growth media, contents of cellulose, hemicelluloses, and lignin of spent EFB (post experiment) were also analyzed. Statistical analyses on the chemical composition were performed. In the first experiment, ANOVA analysis showed that interaction effects between S and C on cellulose, hemicelluloses, and lignin of spent EFB were not significant (p > 0.05). Simple effect of S on cellulose content was significant, but not significant on hemicelluloses, and lignin. Simple effect of C on cellulose, hemicelluloses, and lignin of spent EFB was not significant. A longer composting duration was supposed to lead more decomposition of spent EFB. The possible reason may be because the composting durations were not much different (2, 5, 8 days), and needed to be longer. This fact agreed with the yield of mushroom which was not significant either (Table 1). Table 6 presents treatment combination (S and C) on final cellulose, hemicelluloses, and lignin contents of the spent EFB as the results of LSD comparison analyses. Mean of cellulose content in S1 (33.22%, averaged combinations with C1, C2, C3) was significantly higher than that in S2 (30.56%, averaged combinations with C1, C2, C3) and S3 (28.60%, averaged combinations with C1, C2, C3). This indicated that decomposition rates of cellulose in S3 was higher than that in S1 and could be correlated to the mushroom yield where S3 produced the highest productivity, followed by S2 and S1. Chang and Wasser (2017) stated that substrate decomposition was started from the composting process (Phase I fermentation). This stage is vital for mushroom cultivation because, in this stage, complex organic carbon of substrates is decomposed to simpler forms that will be available for mushroom growth. Humic acid is one of the important products of EFB transformation during the fermentation process (Amir et al. 2010). In the second experiment, ANOVA analyses showed that the interaction effect between N and O factors on cellulose and hemicellulose contents of the spent EFB were significant (p < 0.05), but not significant on lignin (Table 7). Combinations of N1O2, N2O2, N3O2, N2O3, N3O1, and N3O3 (label d) resulted in lower contents of cellulose and hemicelluloses. This could be interpreted that decomposition rates of the EFB in those treatments were higher than in the other combinations. For lignin, none of the combinations was significantly different. If compared to the first experiment, all cellulose, hemicellulose and lignin contents of the spent EFB were notably lower. Chang and Wasser (2017) state that the breakdown of raw ingredients by microorganisms in a fermentation process is more dynamic in a conducive environment. Mohamed et al. (2016) state that in the fermentation process, microorganisms propagate and the nutritive substances of the substrate are accumulated in the form of protein and other useful compounds. Therefore, the effects of fertilizer supplement to the EFB substrate on improving the fermentation dynamics in this research was quite clear. Chemical composition in the spent EFB (Table 7) was the final content after the end of mushroom production. Changes of the chemical composition of EFB took place during fermentation, pasteurization, and mushroom growth. But cellulose, hemicelluloses, and lignin all mainly changed during the EFB fermentation (Wan Razali et al. 2012). In the second experiment, on average, cellulose decreased by 39.94%, hemicelluloses by 37.46%, and lignin by 45.94% from the initial status. According to Bledzki and Gassan (1999), hemicelluloses are the weakest component because the structures are made of polysaccharides, amorphous structures, containing monomer sugar, and are subject to the most extensive degradation. While lignin resists biodegradation and only undergoes partial biotransformation (Jouraiphy et al. 2005). Even known as the hardest component to be degraded, lignin had the highest decomposition percentage among the other two components. This may be because the initial lignin content of EFB in this study was relatively high. Final contents of cellulose, hemicelluloses, and lignin in the spent EFB on average were 23,51 ± 2,32%, 13,53 ± 1.60%, and 13.04 ± 1.22%, respectively. The mushroom productivity (the BCE) as mentioned before was quite low if compared to what Thiribhuvanamala et al. (2012) reported. Our hypothesis is that the straw mushroom productivity can be increased by means of further lowering the final contents of cellulose, hemicelluloses, and lignin in the spent EFB. One potential method may be by doing a better composting process of EFB, but this may not be a simple task. Wan Razali et al. (2012) found cellulose, hemicellulose, and lignin contents of 26.2, 15.4, and 33.3% respectively, in the final compost of EFB fiber mixed with supplemental materials after 3 months of the composting. Contents of the three components, however, are still higher than in this study. Apetorgbor et al. (2015) also found higher contents of those components in the spent oil palm fruit fiber. Rice straw and cotton waste, which are known as the best substrates for straw mushroom, had much lower final lignin contents (4.8% and 0.2%, respectively) as reported by Apetorgbor et al. (2015). Some methods, such as using supplemental micronutrients (Thiribhuvanamala et al.2012), adequate fertilizers (Reyes 2000), mixed materials with low C–N ratios (Zakhary et al. 1984), better aeration and drainage (Apetorgbor et al. 2015), can be potentially used to improve EFB composting techniques. Usage of laccase-producing Trichoderma to breakdown lignin during the substrate fermentation as reported by Bagewadi and Mulla (2017) was also a potential option to apply. Findings in this research suggested that EFB did not need to be cut into smaller pieces if utilized as a straw mushroom substrate. Aeration and drainage in the composting process of the substrate and in the growing bed (in addition to O2, CO2, temperature, and humidity of the environment) might need to be given extra attention. The EFB should not be composted for more than 8 days, because there was a tendency to decrease yield. Supplemental fertilizers increased decomposition rates of EFB, as well as yield and nutritive values of straw mushroom. Because of the fact that BCE was still considered low compared to other methods, there is still room for improvement in straw mushroom cultivation using EFB. We greatly appreciate the support of the Indonesian Ministry of Research, Technology and Higher Education for funding this research. We are grateful for the tireless contributions of the following individuals: Windri Meiawan, Herza Wirasaputra, Aditya Hari Prabowo, Muhammad Muslihudin, Linda Fauziah, and Dian Nova Ayu Pulung. The authors declare that there is no conflict of interest with this research.